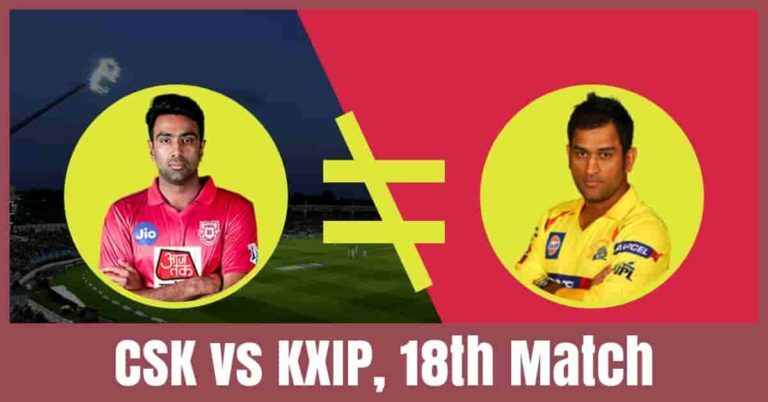 Who Will Win The Match Today of KXIP vs CSK 18th Match Indian Premier League 2019? Despite losing the last match, Chennai Super Kings will be confident as they will play on their home ground. Chennai Super Kings are all set to take on Kings XI Punjab on Saturday, April 06, 2019, at MA Chidambaram Stadium, Chennai. We have covered all the details required to win any grand league in any fantasy cricket platform. The details that we have covered in this post are players recent and past performance, predicted playing 11, players injury updates, who will win today? If you are looking for Chennai Super Kings vs Kings XI Punjab full squad, CSK vs KXIP latest news, pitch report of MA Chidambaram Stadium, Chennai, weather report of Chennai, the best choice for captain and vice-captain, Dream 11 Free teams then you are at the right place. All the details on this post are accurate and taken from very reliable sources. Make sure to read the complete post so that your winning chances increase to 100%. The concept is very simple we predict the players, the players perform and you win. Crix11 is world’s best Dream11 prediction and fantasy sports prediction website and we will not let you down. Chennai Super Kings have played 4 matches, won 3 and lost 1 match. They are in the fourth position of the points table with 6 points in their pocket. CSK have lost their last match against MI by 37 runs. Prior to that, they have won against RR by 6 8 runs, won against DC by 6 wickets and won against RCB by 7 wickets. MS Dhoni, Kedar Jadhav and Suresh Raina are the top scorers of Chennai. they have scored 119, 106 and 101 runs. Dwayne Bravo, Imran Tahir, Ravindra Jadeja and Deepak Chahar are the top wicket-takers. They have taken 7, 7, 4 and 4 wickets respectively. 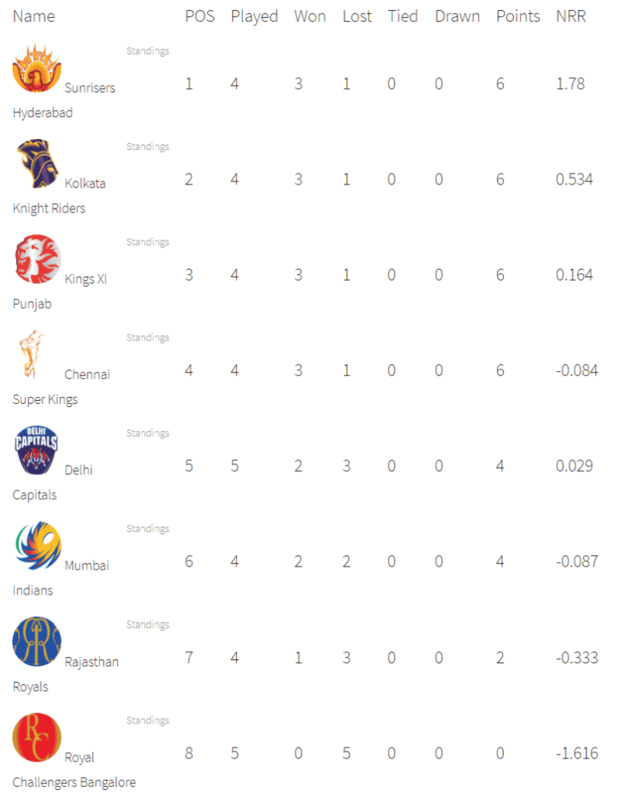 On the other hand, Kings XI Punjab have also played 4 games, won 3 and lost one game. They are in the third position of the points table with 6 points in their pocket. They have won their last match against DC by 14 runs. Prior to that, they have won against MI by 8 wickets, lost against KKR by 28 runs and won against RR by 14 runs. Chris Gayle, Mayank Agarwal and David Miller are the top scorers of Punjab. They have scored 139, 129 and 117 runs. Sam Curran, Mohammed Shami and Hardus Viljoen are the top wicket-takers. They have taken 6, 5 and 4 wickets respectively. Shane Watson, Ambati Rayudu, Suresh Raina, Kedar Jadhav, MS Dhoni and Imran Tahir are the key players of Chennai Super Kings Team. MS Dhoni will lead the CSK team. Dwayne Bravo will not be available for two weeks because of the hamstring injury. Scott Kuggeleijn may replace Bravo in the playing 11. Harbhajan Singh will replace Mohit Sharma or Shardul Thakur. Shane Watson, Ambati Rayudu and Suresh Raina will lead the batting department. Ravindra Jadeja will play as a key all-rounder. Deepak Chahar, Imran Tahir and Scott Kuggeleijn will lead the bowling department. Suresh Raina and Kedar Jadhav are the most valuable players of Chennai. Batsmen: Shane Watson, Suresh Raina, Ambati Rayudu, Kedar Jadhav. Bowlers: Imran Tahir, Scott Kuggeleijn, Harbhajan Singh, Deepak Chahar, Shardul Thakur. MS Dhoni(w/c), Shane Watson, Ruturaj Gaikwad, Ambati Rayudu, Faf du Plessis, Suresh Raina, Murali Vijay, Kedar Jadhav, Sam Billings, Monu Kumar, Ravindra Jadeja, Scott Kuggeleijn, Mitchell Santner, Harbhajan Singh, Deepak Chahar, Dhruv Shorey, Shardul Thakur, KM Asif, Mohit Sharma, Chaitanya Bishnoi, Imran Tahir, Karn Sharma, N Jagadeesan. Lokesh Rahul, Chris Gayle, Mayank Agarwal, David Miller, M Ashwin, Mujeeb Ur Rahman and Sarfaraz Khan are the key players of Kings XI Punjab Team. R Ashwin will lead the KXIP team. Chris Gayle is 100% fit and he may play today. Lokesh Rahul, Chris Gayle and Mayank Agarwal will lead the batting department. Sam Curran and R Ashwin will play as a key all-rounder. Mohammed Shami, M Ashwin and Mujeeb Ur Rahman will lead the bowling department. Lokesh Rahul and Chris Gayle are the most valuable players of Punjab team. Batsmen: Mayank Agarwal, Chris Gayle, Sarfaraz Khan, David Miller, Mandeep Singh. All-Rounders: R Ashwin, Sam Curran. Bowlers: Mohammed Shami, M Ashwin, Mujeeb Ur Rahman. Ravichandran Ashwin(c), Lokesh Rahul(w), Agnivesh Ayachi, Chris Gayle, Hardus Viljoen, Darshan Nalkande, Mayank Agarwal, Simran Singh, Sarfaraz Khan, Nicholas Pooran, David Miller, Moises Henriques, Mandeep Singh, Arshdeep Singh, Sam Curran, Mujeeb Ur Rahman, Murugan Ashwin, Andrew Tye, Mohammed Shami, Varun Chakravarthy, Karun Nair, Harpreet Bra, Ankit Rajpoot. The pitch of MA Chidambaram Stadium, Chennai is known for its spinning track. It is predicted that the wicket will be slow and sluggish and the spin bowlers can get the maximum purchase from the wicket. There will be no dew. Dream11 Fantasy Cricket Tips: Try to take spinners in your teams. A hot and humid day is predicted today. The weather is forecasted to be mostly sunny and it will remain the same throughout the day. The sky will be clear and there is no sign of rain today. the temperature is expected to be 33-Degree Celsius and the humidity to be 58%, which may go up to 78%. Dream11 Fantasy Cricket Tips: The weather condition may favour the spin bowlers. Last season, Chennai Super Kings and Kings XI Punjab, both the team have won one match each. If we look at the statistics of the last five matches between KXIP vs CSK, CSK has won four matches and KXIP has won only one game. According to Crix11 Astrology Cricket Match Prediction, CSK will win the match. The team winning the toss should opt to bat first. According to Crix11 astrology prediction, KXIP will win the toss and opt to bowl first. You May Like to Read All IPL Match Prediction. This is it for Today’s CSK vs KXIP Dream11 Fantasy Cricket Prediction 18th Match. What is your best team? What do you think Who Will Win Today? Leave a reply in the comment section.